Music that has descriptive, naturalistic titles usually makes me uneasy, because that commercial model has bred too many cheesy pieces of music. 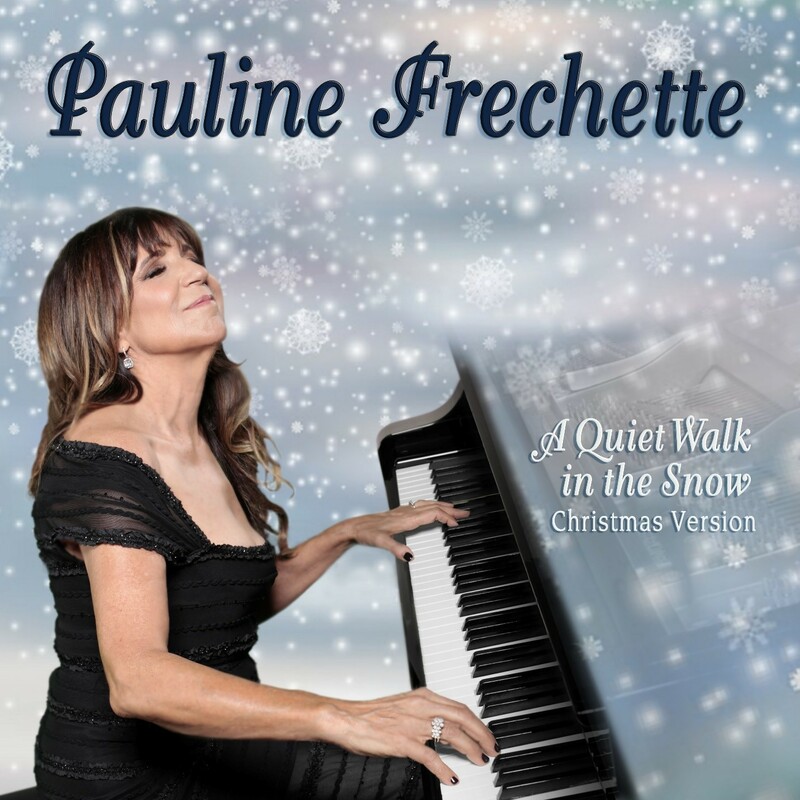 However, Pauline Frechette’s “A Quiet Walk in the Snow – Christmas Version” is a delightful surprise. Even if you aren’t into classical music, hear me out. This is different. This is beauty personified in a format that is more than just accessible; it’s as if it were always a part of me. I don’t know how else to describe it. Out of curiosity, I clicked on Pauline’s web site -www.paulinefrechette.com – to listen to the original version of “A Quiet Walk in the Snow”; it became immediately apparent why it has had over 500,000 hits between Soundcloud and Spotify. The original version is beautiful and has received rave reviews. The Christmas version weaves in bell-like elements, to give it a particularly late December flavor. Listening to Pauline Frechette’s “A Quiet Walk in The Snow ~ Christmas Version” takes one to an idyllic winter scene, a place where the purity of the winter season is brought to life with gentle emotion devoid of commercial frenzy. This is an instrumental piece that I have fallen in love with, perhaps because the music takes me to one of those idealized Christmas nights. Somehow, just immersing myself in Pauline’s music with David Campbell’s gorgeous orchestration, I found myself magically transferred into a world where the perceptions were so real, I could swear I felt the cold wet kiss of snowflakes on my nose while gazing into a starlit night with only the faint glow from a Christmas tree shining through a window as I took a quiet walk in the snow. That’s my own poetic tangent, but you’ll probably have one of your own. The composition of “A Quiet Walk in the Snow” is reminiscent of classical piano music by Eric Satie or Edvard Grieg. It’s simple and graceful with the soft colors one can readily associate with the sound of walking on freshly fallen snow in the woods. At first, using woodwinds such as clarinet and flute doubling the string melodies gives the strings an airy and glistening tone, like fresh, cool and soft snow underfoot. The melody makes a relaxed hopeful impression, and then finishes the phrase in a light thoughtful way, as if one has just recalled how beautiful the scene was a few minutes ago, after moving on to another bend in the path. When the melody returns, the strings take over a bit more, so that the sound is more lush and warm. But all these nuances are subtle. There is a restraint that makes the piece more modern than the earlier 19th century composers in their descriptive music, hence the term neoclassical seems appropriate here. Because of this subtlety, the piece can be experienced in a light, refreshing mood, or can be heard with greater depth of feeling and meaning – the subtext for contemplative romantic thought, perhaps. Subtlety of emotion is the strength of this brief gem. In this version of the piece, a delicate harp floats through the background and later the bell tones of a celeste are added in, suggesting an artful hint of Christmas classics such as “The Nutcracker” ballet. One of the things I like so much about Pauline’s music, is that her melodies stay with me long after I’ve listened. As a reviewer I hear quantities of songs and often, even if the overall production is good, there is not a deep emotional connection for me. This is not the case with “A Quiet Walk in the Snow.” Although the composition clocks in at under two minutes, it is two minutes of gorgeous melody and emotional composition, arranged with the skill and originality that has marked David Campbell’s illustrious career. Frechette has an extended background singing with such icons as Willie Nelson, Cher, Neil Diamond, Paul McCartney, Leonard Cohen, and Muse, as well as on multiple film scores including: Rent, Aladdin and Wayne’s World. She has composed a large repertoire of theatrical music & lyrics, which have enjoyed various productions starring luminaries like Donna Murphy, Paul Reubens (of Pee Wee Herman fame), Karen Black, Melanie and Elliott Gould. Her classical compositions have been performed by the Baltimore Symphony and The Hollywood Bowl Orchestra. Frechette and Campbell have collaborated for years as creative and romantic partners. In fact, in celebration of their anniversary there will be a new album release, “Always Lovers”, scheduled to drop on Valentine’s Day, 2018. Might I suggest that If you’re beginning to feel the pressures of the holidays coming on, take two minutes to close your eyes and be refreshed by the contemplative mood of “A Quiet Walk in the Snow – Christmas Version.” I’m certain you won’t be disappointed. Ron Powers is an independent A&R specialist and music industry consultant, and is constantly searching for, discovering and writing about new talent.